In East Texas, we’ve just had our first taste of cooler fall weather, and it just gets better from here. 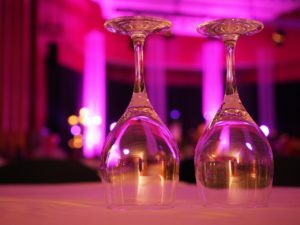 Some of the biggest events in the area take place this month, and staying at Rosevine Inn Bed and Breakfast puts you minutes from them all. There’s a lot to cover, so let’s get right to it. Pick your day and then check out the website to book your room! If you’re looking for an old-fashion fun movie to get you in the spooky mood perfect for October, Liberty Hall, our famous downtown theatre, is playing the 1984 Ghostbusters at 7 pm on October 4th. Check out the website for other fun and spooky movies showing during the month. You can also participate in a Hocus Pocus Sing-Along on Saturday, October 6. Tickets are available on their website. Click here for more info! Speaking of movies, Tyler Parks and Recreation presents part of its annual fall movie series October 6 when it shows “Wonder.” Grab a blanket and a picnic and enjoy a movie under the stars at Bergfeld Park. It is so much fun. Every month Hit the Bricks brings Tyler residents, artisans and business owners together for something amazing, but this might be one of the most anticipated weekends of the year because of Tyler’s Taco Throw-Down! East Texas is home to great tacos, and at Hit the Bricks vendors battle to see who makes the very best. Event attendees have the chance to buy tacos from all the competitors and make their own decision. Event coordinators are announcing the contestants soon, and until then we’re on the edge of our seats craving all things taco. The day also includes art gallery exhibits, a Downtown Tyler Film Festival, a historical self-guided walking tour, live music and more. Find the rest of the Hit the Bricks schedule on the visittyler.com website. Nothing follows a taco throw-down like a black tie ballroom gala. The 2018 Benefit Gala takes place on Saturday, October 13 at the Tyler Rose Garden Center and features nationally acclaimed ballroom dancers Christopher Wayne and Mallor Evan. Music is provided by the East Texas Jazz Orchestra. Get your tickets at refugeoflight.org. Tyler is the Rose Capital of America, with the nation’s largest rose garden that also serves as one of 24 All American Rose Selection test gardens. For decades the rose industry has been a part of the rich tapestry that makes Tyler great, a fact celebrated during the annual Texas Rose Festival. The Rose Show — From Thursday October 18 at 10 a.m. until Sunday at 4. p.m., see more than 7,000 rose blooms arranged around the “Rock the Rose” theme at 420 Rose Park Drive. This is free and open to the public. How to Select the Best Rose for Your Garden — Learn just that for free at the Rose Garden Center at 11 am on Friday October 19. Texas Rose Festival Coronation — Also Friday October 19, see the queen crowned at the 2 pm Matinee Coronation or the 7 pm Evening Coronation. Tickets available at texasrosefestival.com. Texas Rose Festival Parade — If you miss everything else, be sure to catch the parade at 9 am. See the route at texasrosefestival.com. Texas Rose Festival Queen’s Tea — Stop by the Tyler Municipal Rose Garden for the final event featuring the queen. For more on the event, Queen Amanda Elaine Hiles and the Texas Rose Festival, for more info just click the blue to check out this brochure. In Tyler October is the month for coronations and parades, but like everywhere else, it’s also the month for uninhibited enjoyment of all things fall. When it comes to pumpkin picking, creepy mazes and family-friendly activities, here are some of our most spooktacular offerings. 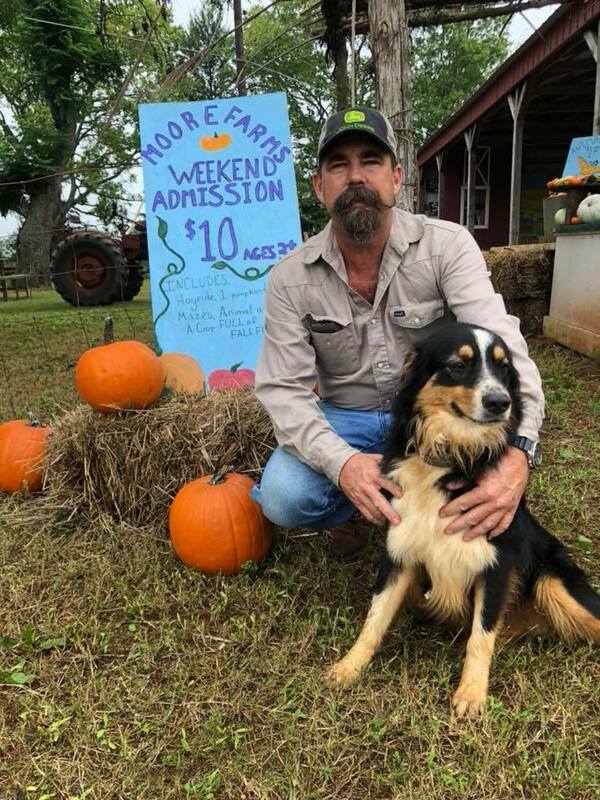 For so many East Texas families, this Canton farm is a longstanding tradition. If you go once, you’ll see why. Opening day for fall 2018 was September 29, so all of October you’ll experience it at its peak. 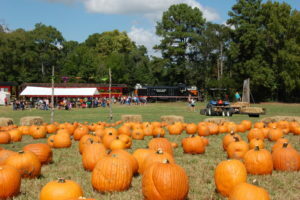 The farm is on I-20 and offers a pumpkin patch, a three-acre corn maze that changes every year, farm animals and more. At night visitors have the option of visiting Fright Farm with Chuckle’s Fun House, glowing pumpkin goblins and paintball. Yesterland Farm recommends Fright Farm for kids 8 years and older. 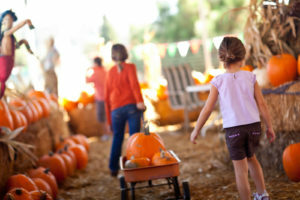 Unleash the kids this harvest season and set them loose in a Pumpkin Patch full of interactive games, prizes, tricks and treats! 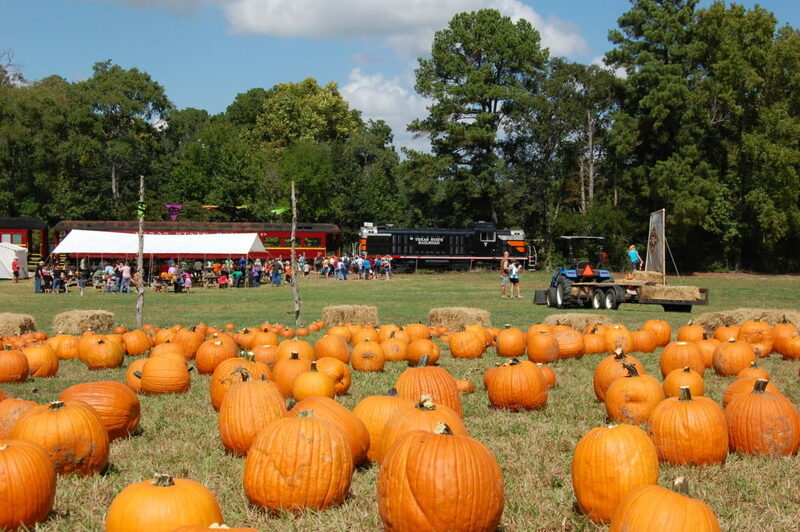 Kids of all ages love the ride aboard the historic rails from the Rusk depot to Texas State Railroad’s very own Pumpkin Patch. It’s a short 30-minute train ride with departure times at 10:00 a.m. and 1:00 p.m.. All passengers, young and old, are encouraged to come attired in their Halloween finest. Click here for more info. Weekdays closed for reserved school field trips. Weekends – Saturdays 10 a.m. – 6 p.m., Sundays 1 p.m. -5 p.m.
Canton First Monday Trade days are one weekend every month on Thursday through Sunday prior to the first Monday of the month. The next Canton dates are November 1-4. The weather should be great!! The area around Tyler has beautiful fall foliage year after year. Peak week comes to our area later than in much of the nation. This 2018 Fall Foliage Website predicts when we will see peak color. 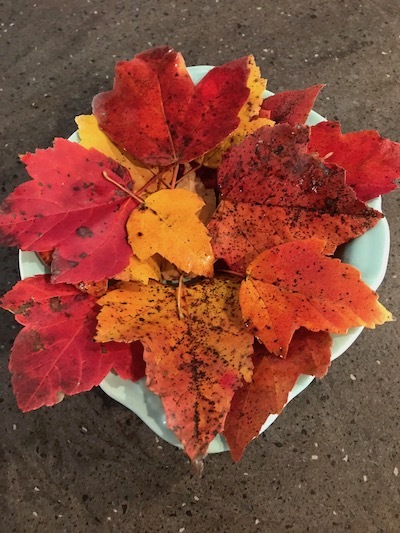 We never know when the leaves will change but they are beautiful when they do. Since we have such a long fall season, come check out our beautiful drives often! October is a fantastic time to book your getaway at Rosevine Inn, but it’s also a time many people start to think about the holidays. 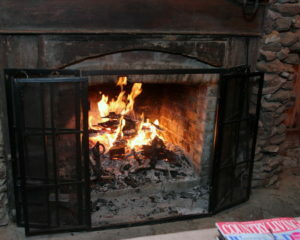 A gift certificate to Rosevine Inn makes the perfect gift for everyone on your list. Buy one on our website or give us a call at 903-592-2221. Ho Ho Ho!! 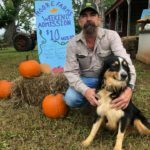 This entry was posted in Tyler Things to Do, Uncategorized and tagged Canton Trade Days, Cowan Center, Downtown Tyler, Liberty Hall-Tyler, Rosevine Inn, Texas State Railroad, Tyler Rose Garden, Tyler Things to do by Missy Ticer. Bookmark the permalink.